In 1865, a Methodist minister named William Booth left the pulpit to preach as an independent evangelist in the slums of London. In 1878 Booth adopted the name “The Salvation Army.” Missions became “Corps,” members “soldiers,” ministers “officers” and Booth himself, “General.” The mission was to help people who lived in the squalor of the slums of London by offering “soup, soap and salvation.” As time went on, the Army furnished itself with uniforms, flags, bands and martial music. It met in tents, theatres and the outdoors and adopted many outward military characteristics. In 1880, the Army began work in New York. The Salvation Army came to La Crosse in March of 1896 and began reaching out to people from a building on 200 Main Street. The next 24 years were rocky, with the Army at times needing to close up shop due to lack of funding, lack of community support and other problems. 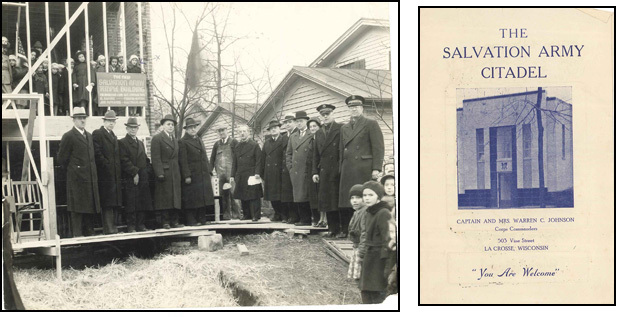 In February of 1920, The Salvation Army came marching back to La Crosse with the determination to stay in the community. Though the Army has operated out of several locations over the years, the work has continued and become an integral part of what the community has to offer. Under the direction of Lieutenants Steve and Jackie Hull, and completed by Captains Lee and Melody Morrison, The Salvation Army moved into its current location on 8th and State Streets in 1990. Today, The Salvation Army in La Crosse operates the only emergency shelter of its type within a 100 mile radius and operates the community’s largest meal program. The Salvation Army reaches out to people in need beyond areas of poverty and has historically played a significant role in the lives of military personnel stationed overseas. During the two world wars, The Salvation Army operated more than 3,000 service units-- actions which led to the formation of the USO. Another major contribution of The Salvation Army during the war years was to help make it possible for soldiers to communicate with their loved ones at home. The Salvation Army mail service was often as efficient as that of the army and postal service. The Salvation Army continues to help countless hungry people through its food distribution programs. Emergency canteens have been common sights at natural and man-made disasters. The Salvation Army served 5 million meals and spent 65 million dollars in providing financial assistance, social services and spiritual, grief and emotional counseling to more than 125,000 people. More than 107,000 Salvation Army employees and volunteers responded to the 9/11 disasters in New York, Washington, and Pennsylvania by logging more than 1.6 million hours of service.